Authorities in Kazakhstan have burned through $414 million over two days in an effort to halt the slide of the country’s currency, the tenge, which broke the psychologically important barrier of 300 to the dollar on September 16. But the emergency government intervention may be too late for people like Almaty trader Natalya Ovchinnikova, who is nervously looking down the barrel of bankruptcy. The surge of the US dollar against currencies of developing economies across the world has been producing many tales of woe in Central Asia, prompting governments to either surrender to events, or resort to their characteristic authoritarian methods to contain alarm. Kazakhstan’s National Bank stopped propping up the tenge in August. In the ensuing weeks, the value of the currency plummeted by 50 percent, and the last few days have been particularly cruel. On September 16, the tenge closed at 283 to the greenback on the Kazakhstan Stock Exchange and hit a new low of 300 in currency exchange shops. A Central Bank purchase of $144 million on September 16 was followed by a $270 million injection the following day. That action has helped restore some health to the tenge, but it is unclear if this sudden change of policy should be read as a renewed government commitment to steady intervention. The tenge price of goods that Ovchinnikova and other traders like her buy for euros or dollars will now soar by 50 percent. The prospects seem clear. “People won’t buy it — there’s no trade as it is,” Ovchinnikova told EurasiaNet.org. With a higher cost of living, many will be saving less. And foreign vacations that many middle-class Kazakhstanis had increasingly taken for granted seem set to become an unaffordable indulgence. For all that, the public in Kazakhstan appears to be taking events in their stride. 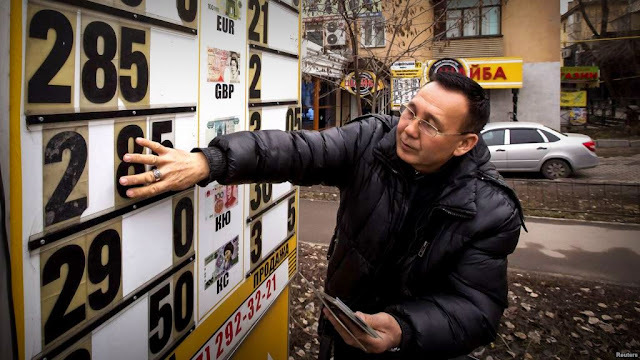 Unlike last year, when a currency devaluation prompted savers to besiege the National Bank and take to the streets of Almaty in frustration, there have been no notable murmurs of unrest. The tremors shaking Kazakhstan are also being felt in neighboring Kyrgyzstan. Over the past year, Kyrgyzstan’s som has slipped almost 30 percent, and took a particularly deep dive to around 70 to the dollar this week. National Bank officials in Bishkek signaled their intent to hold their fire in late August. Chairman Tolkunbek Abdygulov said at the time that interventions in the currency market would not happen unless there were sharp fluctuations. That policy kicked in on September 14, when the National Bank sold $17.6 million in its first intervention since July 23. Not that it did much good. And matters have not been made easier for some by Kyrgyzstan’s recent entry into the Moscow-led Eurasian Union trading bloc, which also includes Kazakhstan, Armenia and Belarus. “The dollar rate has increased, as have the custom levies for imports from China after we joined the Eurasian Economic Union, so the prices on our goods have increased almost two or three times since the start of August,” said Yulia Smirnova, 25, who sells bathroom fittings at a store in central Bishkek. Traders at Bishkek’s colossal Dordoi market say they are being forced to hike their prices daily to keep up with the rising dollar rate. Smirnova said the impact has been particularly strong on middle-class customers. It remains to be seen if salaries will adjust in line with external currency shocks. Aida Ryspaeva is one of the small army of the Bishkek street corner sellers of the immensely popular Shoro brand of traditional Kyrgyz drinks. “I have been selling drinks for almost eight years already. My monthly salary is 6,000 soms ($87). That hasn’t changed because of the fluctuations,” said Ryspaeva, who said she uses her income to raise her two children. Currency troubles are also rippling into Uzbekistan, where the value of the sum, the national currency, has dropped by around 40 percent on the black market since the beginning of the year, and is now pushing 5,000 to the dollar. By contrast, the official rate has only depreciated by some 8 percent. “It’s bad for people who deal in sums, or for people who sell consumer goods for sums locally, like construction materials and anything else they import for dollars,” one Tashkent-based businessman working in the telecoms sector told EurasiaNet.org on condition of anonymity. People receiving revenue in dollars, such as real estate agents, car sellers and anyone receiving hard-currency remittances from labor migrants abroad, meanwhile, are getting more bang for their buck, he said. It is hard to draw much reliable information from Turkmenistan, but there are clues there that not all is well, even though the exchange rate has nominally stood fast at 3.5 manats to the dollar. Since the start of August, a strict $1,000 limit has been placed on how much foreign currency people can buy. Buyers of international currencies have to produce their passport to complete the transaction. Anybody with savings substantially above $1,000 may feel nervous, which could, in turn, fuel a surge in black market activity. In Tajikistan, the somoni has fallen by 17 percent against the dollar. The country’s economically most important import — cash remittances sent home by migrant laborers from Russia — has fallen by 60 percent in value in dollar terms, according to Russian Central Bank data. To remedy the devaluation, Tajikistan’s National Bank on April 16 ordered the closure of private money exchange outlets. The operators of exchange bureaus were also obliged to apply for licenses from lending institutions to resume work. Officials said this measure would help them keep a closer eye on the operations of money exchange businesses. In practice, there are now three rates at play. The official National Bank rate of 6.4 somonis to the dollar, about 6.55 somonis advertised at street exchanges, and the actual rate of 6.8 or so charged in transactions. All this is largely technical anyhow, as buying dollars has become virtually impossible. Many Tajik businesses are instead turning to the Chinese yuan. "I buy yuan from my friends who work in exchange bureaus to buy goods in China. It is easier and less stressful,” said Manzura Holova, a trader at the Sadbarg shopping center in Dushanbe. The Tajik turn to China was underscored by a 3 billion yuan ($470 million) currency swap deal in early September that is designed to facilitate trade between the countries. Tajikistan’s National Bank has said funds from China will be used to support the somoni, for loans to small and medium businesses and to ward off balance of payments crises. Dushanbe-based economist Muhammad Umarov voiced doubt that the Chinese cash would be enough to keep somoni healthy. “The People’s Bank of China is providing yuan, not dollars. This money will go toward supporting the yuan rate against the somoni. The yuan too has lost 3.5 percent of its value against the dollar. The yuan rate will now be stable, but we will have to see about other currencies,” Umarov said. Joanna Lillis is a freelance writer who specializes in Central Asia. Anna Lelik is a Bishkek-based reporter.